Australians Nick Flanagan and Jason Scrivener are tied for the lead after the second round of the men's Vic Open at 13th Beach. Nick Flanagan held it together in increasingly tricky conditions on Friday to claim a share of the halfway lead with fellow Australian Jason Scrivener at the Vic Open. Flanagan had bolted out of the blocks with a spectacular opening round of 10-under 62 at 13th Beach on Thursday. But the 2003 US Amateur champ was even more satisfied with his four-under 68 on Friday afternoon as the wind picked up late in the day, with conditions predicted to get tougher again over the weekend. "Yesterday was a bit of a surprise but at the same time I played well and got everything out of my game," said Flanagan. "I was probably happier with today's round, considering it was backing up that 62. "It could have been anything today; it probably could have been a couple better but I've had my fair share of long putts and good breaks the first two days so to be up there at the top of the leaderboard is obviously great. "We'll go out there on the weekend and keep doing what I'm doing." A victory at the Vic Open and the accompanying two-year exemption on the European tour would be a career changer for the 34-year-old Flanagan, who does not currently hold playing status on any overseas tours. The situation is much different for Scrivener, who is in career-best form. 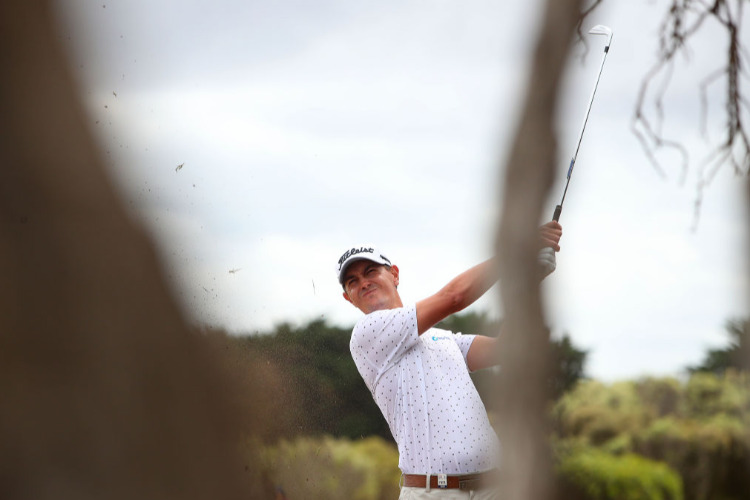 The West Australian has recorded three top-10 finishes in his past four European Tour events - including a tie for seventh at the Dubai Desert Classic in late January. He made the best of calm morning conditions on Friday with a bogey-free 66. "Any time your game is in a good place and you're constantly making cuts and putting yourself in contention it's good for the confidence," he said. "I just think that over the last 12 months I've made some big improvements on my game and just steadily progressed over the last couple of years. "I feel like it's in a good position and I just want to give myself more chances to win tournaments." Local players filled the top five spots on the leaderboard after the opening two rounds, with Wade Ormsby in outright third at 13-under 131, one shot clear of Matt Jager and Brad Kennedy. But defending champion Simon Hawkes and the man he beat in a playoff to win last year's title, Harrison Endycott, both missed the halfway cut, as did 2017 Vic Open winner Dimi Papadatos.